The Iridium satellites are relatively small telecommunications satellites in a low Earth orbit. They are part of a world-wide system for mobile communications operated by the Iridium LLC Corporation. When complete, there will be a total of 66 satellites in 6 orbit planes, at an altitude of around 780km. As can be seen from the diagram opposite, each satellite has three main mission antennas (MMAs), which are flat, highly reflective surfaces, that can reflect the Sun's rays to an observer on the ground when the geometry is correct. The satellite's attitude is controlled so that the long axis remains vertical, with one MMA always pointing forwards. Given this knowledge of the attitude, together with the orbital position of the satellite and the Sun and observer's location, it is possible to calculate the angle between the direction to the observer from the satellite and the line of a perfect reflection of the Sun. This is the so-called "mirror angle" and determines the magnitude of the flare. 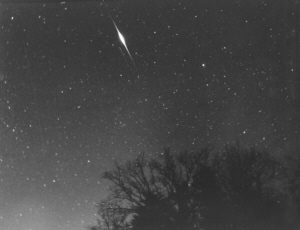 The photo on the right of two Iridium flares was taken by Porter Kier on January 11th, 1999. It shows Iridiums 20A (Mag. -2) and 22 (Mag. -7) above the Chesapeake Bay, Virginia area. For more information on the photo, and a full size version, just click on the image. We will now explain each of the table columns in turn. The date on which the flare occurs (in local time). Several flares can occur on the same day. The exact time when the flare reaches its maximum brightness (in local time). The estimated maximum intensity of the flare in the standard astronomical magnitude scale. This is a logarithmic scale and it is important to note that lower numbers represent brighter flares. The scale is defined such that a magnitude difference of 5 represents an intensity difference of factor 100. Thus a magnitude -7 flare is one hundred times more intense than a magnitude -2 flare. As a comparison, the brightest star in the sky (Sirius) has magnitude -1, the planet Venus (the brightest star-like object) can reach magnitude -5, and the full Moon shines at magnitude -12. Please remember that these magnitude estimates are only approximate, and are affected by errors in the Iridium satellite attitude and position errors of the observer's location. A 10km position error on the ground can easily result in an estimated magnitude error of several magnitudes. This is the angle above the horizon, in degrees, at which the flare reaches its maximum intensity. This is the angle measured clockwise around the horizon from true north, at which the flare reaches its maximum intensity. Thus, an azimuth angle of 0° represents north, 90° is east, 180° is south and 270° is west. To make sure you are interpreting the angles correctly, start facing the northern horizon, then rotate clockwise through the azimuth angle about the local vertical axis. Finally, look up from the horizon through the elevation angle. This is the angle between the line from the satellite to the observer and the direction made by the specularly reflected rays of the Sun. So a mirror angle of 0° represents a perfect reflection of the Sun off the mirrored surface of the antenna to the observer, and corresponds to the maximum possible intensity. Angles greater than 0° produce flares that are less intense. The final column gives the name of the satellite producing the flare. Clicking on the name will take you to that satellite's information page.